Steampunk and Mechwarriors. If you’ve ever wanted to combine the two and face off in an epic battle, perhaps Heavy Steam, now on Kickstarter, is a game you should check out. We had a chance to chat with designer Scott Kimball and as a few questions. Read on faithful viewers. Futurewolfie’s questions are in bold; response from Scott are in normal-weight text. Can you tell us a little bit about yourself? How did you get into gaming? My gaming started, as it did with many folks growing up in the late 70s and early 80s, with the red box edition of Dungeon and Dragons when I was in 5th grade. From there other RPGs were soon to follow, Gamma World, Traveler, Pendragon. My board gaming really began with my neighbors copy of Dune, which we played incessantly in 5th and 6th grade and beyond. Along with Dune, Talisman, Wiz-war, Star Fleet Battles and Civilization were the staples of my gaming in Junior High and High School. What is your favorite game (and you can’t say any game you’ve designed)? My favorite game of all time is The Republic of Rome, a semi-cooperative game set in the tumultuous times of the late Roman Republic. Players play Roman senators trying to keep the republic safe from enemies foreign and domestic all while advancing their own careers. It’s the perfect game for those who like backstabbing their friends for political gain and then making long speeches about how you needed to do it for the betterment of the people. Currently the game that has been hitting my table the most is Terra Mystica. It’s a cruel, cruel game that tricks you into thinking you are doing well only to hurl you off the cliff of defeat when you make any single mistake. It’s wonderful. All right, lets talk about your game. Can you give us a quick overview of Heavy Steam? What’s it about? What makes it cool, fun, or unique? 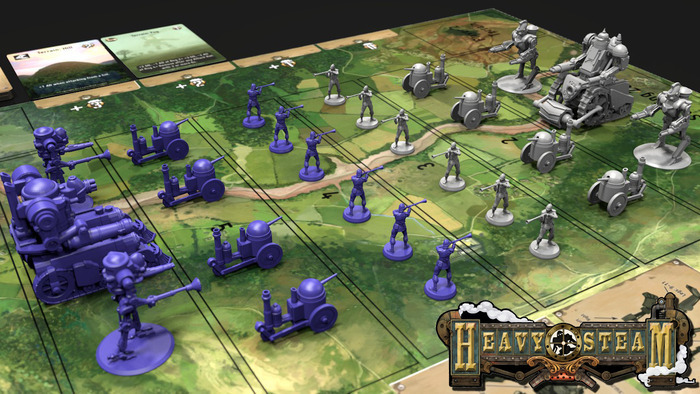 Heavy Steam is a game of giant, steam-powered mechs, which we call Steam Titans, dueling it out on the battlefields of Victorian Europe. What makes the game unique is that the focus of play is on the inner workings of the Steam Titans themselves, where players must manage the steam flow through their Titan in order to power up all the systems they will need for victory: weapons, shields, mobility, etc. 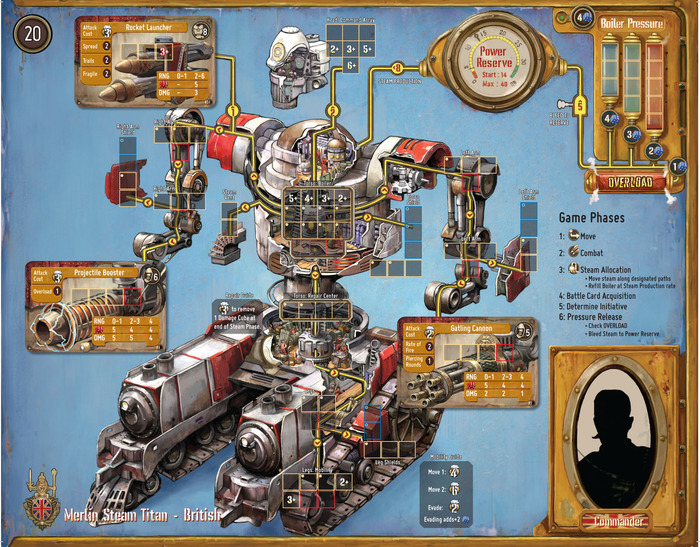 Each player has a board for their Steam Titan which displays these systems and the pathways steam must travel through the Titan to get where it needs to be. Players must plan their steam allocation carefully, thinking many turns ahead, since steam does not instantly travel to its final destination but may take 2 or 3 game turns to arrive. The decisions players make in moving their steam within their Titan plays out on the battlefield itself. A battle board shows the relative range between the opposing titans and this range is used to determine how many attack dice a weapon rolls when making an attack and how much damage it does if it hits. This battle board is abstracted to a degree: there are no hexes or squares through which the Titans move, only range bands that, as I said, determine how far the opposing forces are from each other. Battlefield terrain, such as woods, streams and hills, are handled via card play rather than being present on the battle board map. Usually victory comes with the destruction of your opponents Steam Titan, but there are a number of scenarios in the game where other victory conditions could apply. For instance, the Critical Recovery scenario tasks the players with recovering a downed zeppelin holding top secret information crucial to the war effort. The zeppelin lies in the middle of the board between the two opposing forces so the battle becomes a game of bluff and courage, as Steam Titans rush forward into enemy fire to try and seize the objective. So is this a 2-player game? About how long does it take to play? The game is designed to be played 2, 3 or 4 player. There are currently two factions in the game, Britain and the C.E.T (Central European Trust), so in 3 and 4 player games the players are broken up into two teams. A 3 player team consists of 2 players in light steam titans facing off against 1 player in a heavy steam titan, and 4 player games have 1 light and 1 heavy steam titan per side. Playing with 2 players, the game takes a little over an hour to play on average, depending upon the scenario played. 3 and 4 player games take a little longer. Many of the scenarios end when a single titan is destroyed, and it is very possible that luck and good strategy could make this happen very quickly. I’ve had games end within a half hour due to someone’s titan head being blown off with a well placed shot! What do you enjoy most about designing board games? What is the biggest challenge? For me the joy in designing board games comes when that “Aha!” moment hits. This might happen early on in the process when you think of an awesome mechanic that is going to really set your game apart, but more often it comes later in the process when you have been struggling to lift the game from ‘pretty good’ to ‘great’ and you finally make a break through that accomplishes that goal. One occurrence of this during the design of Heavy Steam came when I finally created a level of balance for 2 light titans battling 1 heavy titan, a match up I desperately wanted to get right so the game could be played 3 player. That later process, when you are polishing the game, looking for things to improve, tweaking and adjusting mechanics, is the hardest part of designing a game for me. I spend a lot of time doing these things and go down a lot of dead end paths trying to squeeze that little extra bit of goodness from the game. It can get discouraging sometimes, so it is good to have other folks around you, people to play the game and give you honest feedback with an outsiders perspective. This really can help you stay focused and not lose sight of your original goals and ideas. While designing Heavy Steam, did anything unexpected ever come up during testing that was really cool and surprising and fun? Was there anything you were certain would work and turned into a total disaster? My original design of the game had predetermined steam titan weapon load-outs. 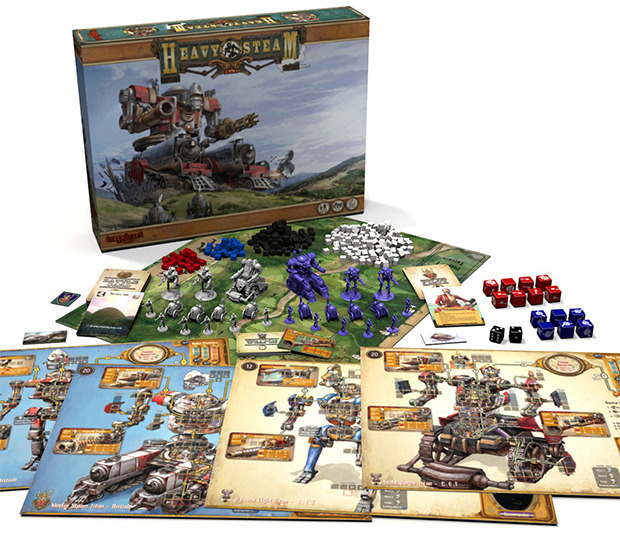 Players would choose a variant of the basic heavy or light steam titans before a battle, and each of these variants had their own player board for use in battle. When I started working with Greenbrier Games to develop the game Jeff almost immediately suggested using weapon cards to overlay the displayed weapons on a single titan board to allow the players to customize their titans that way rather than having all those extra players boards. It was so obvious in retrospect, but it never occurred to me. That was a fun moment for me. There were no real disasters that happened during the design of Heavy Steam that ever got to wide spread testing. Of course, when I’m in full design mode I have plenty of thoughts and ideas that are terrible, but I usually manage to weed them out before I embarrass myself. At one point I was pretty sure that using a 1-100 percentile dice system for combat would be a good idea. Thankfully I changed my mind. Unfortunately one of my friends played the system that way. He’s been dealt with so no one need know. Oh wait…Question 6: What are you most proud of in the final design of the game? That I was able to keep the focus of the game more on the steam titan board than the battlefield board. This was my original concept for the game, to have players thinking more about how to move steam through their titan than about maneuvers or tactics on the battlefield. But along the way there was a lot of mechanic and thematic pressures (meaning, it would have been easier) to move things more towards the battle board, making the game more of a miniatures tactics game. But I stuck to my guns and I think the game is much, much better for it. Do you have any advice you could share for aspiring game designers? As I mentioned before, make sure you have plenty of smart playtesters at your disposal. And don’t just use them when the game is done, but have them look at the game periodically during the entire design process. You cannot design a game in a vacuum and you need fresh eyeballs to come in every now and then to call shenanigans if you get out of control, or to give you advice when you have design block. Any other comments you’d like to share to our audience? We want to do a lot more with the world of Heavy Steam beyond the core set that is on Kickstarter now. Greenbrier always listens to the advice and suggestions of players, so drop on by the Heavy Steam BGG forums and our Facebook page, take a look around, give us a piece of your mind, and let’s build this world together! If Heavy Steam sounds as cool to you as it does to me, make sure to check it out on Kickstarter and help support the game! $75 gets you a copy of the miniature-loaded game of steam-powered mechs. This promotional interview was paid for by Green Brier Games.